The peak position of the C=C stretch Raman band of S1 trans-stilbene changes linearly with temperature and serves as a reliable “picosecond thermometer” that can measure the temperature in solution with picosecond time resolution. We use this “thermometer” for studying the vibrational cooling process of photoexcited S1 trans-stilbene in solution. In molecular liquids, the cooling rate of S1 trans-stilbene shows a clear linear relationship with the thermal diffusivity of the solvent　(▲ in Fig. 1). In ionic liquids, however, the cooling rates do not show correlation with thermal diffusivity (● in Fig. 1). Furthermore, the cooling rates in ionic liquids are very similar with those of molecular liquids, despite the large differences in thermal diffusivity. We interpret this result in terms of the local structure formation in ionic liquids. The cooling rate reflects the microscopic solvent environments within the local structure. The thermal diffusivity, on the other hand, is determined by the macroscopic heat transfer that includes the slow energy transfer across the local structure boundaries. Ionic liquids can not be characterized with simple macroscopic liquid parameters because of microscopic inhomogeneities due to the local structure. Fig. 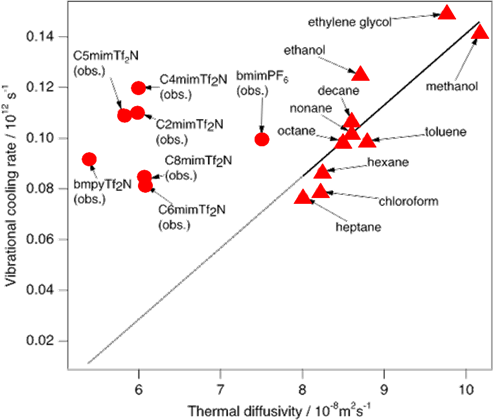 1 Plot of vibrational cooling rate vs thermal diffusivity for 10 molecular liquids (▲) and for 7 ionic liquid (●). 1-15) Chem. Lett.,　36,　504-505　(2007). A broadband multiplex coherent anti-Stokes Raman scattering (CARS) micorospectrometer has been constructed with the use of a femtosecond super continuum light generated with a photonic crystal fiber. It covers a wide (~3500 cm-1) wavenumber range and is capable of recording high S/N CARS spectra with an accumulation time of 50 ms. The lateral spatial resolution is 0.5 μm and the depth resolution 1.5μm. We apply this system to observe the cell division process of fission yeast. The CH stretch CARS band is used for imaging (Fig. 2). The change with the cell cycle of the distribution of membrane organelles including mitochondria is clearly visualized. The formation of a septum at the middle of dividing cell is also clearly seen. CARS microspectroscopy enables real-time, non-invasive molecular level imaging of living cells without any pre-treatment. Fig. 2 Time-resolved CARS images (CH stretch band) of dividing fission yeast cells. Each image consists of 61x61 pixels and takes 3.8 min to measure. 1-4) Analytical Chemistry.,　79, 8967-8973　(2007). Behaviors of the “Raman Spectroscopic Signature of Life” in Single Living Fission Yeast Cells under Different Nutrient, Stress and Atmospheric Conditions. Yu-San Huang, Takeshi Nakatsuka and Hiro-o Hamaguchi, Appl. Spectrosc.,　61, 1290-1294 (2007). Ultrabroadband (>2000 cm-1) Multiplex Coherent Anti-Stokes Raman Scattering Spectroscopy Using a Sub-Nanosecond Supercontinuum Light Source. Masanari Okuno, Hideaki Kano, Philippe Leproux, Vincent Couderc and Hiro-o Hamaguchi, Optics Lett.,　32, 3050-3052 (2007). Coherent Raman Imaging of Human Living Cells Using a Supercontinuum Light Source. Hideaki Kano and Hiro-o Hamaguchi, Jpn. J. Appl.Phys., 46, 6875-6877 (2007). Supercontinuum Dynamically Visualizes a Dividing Single Cell. Hideaki Kano and Hiro-o Hamaguchi,　Analytical Chemistry.,　79, 8967-8973　(2007). Intra- and IntermolecularVibrational Eenergy Ttransfer inTungsten Carbonyl Complexes W(CO)(5)(X) (X = CO, CS, CH3CN, and CD3CN). Motohiro Banno, Koichi Iwata and Hiro-o Hamaguchi,　J. Chem. Phys.,　126,　204501 (1-9)　(2007). Picosedond Time-resolved Fluorescence Study on Solute-Solvent Interaction of 2-Aminoquinoline in Room-Temperature Ionic Liquids: Aromaticity of Imidazolium-Based Ionic Liquids. Koichi Iwata, Minoru Kakita and Hiro-o Hamaguchi,　J. Phys. Chem. B,　111,　4914-4919　(2007). Vibrational Cooling Process of S1 Trans-Stilbene in Ionic Liquids Observed with Picosecond Time-resolved Raman Spectroscopy. Koichi Iwata, Kyousuke Yoshida, Yuta Takada and Hiro-o Hamaguchi, Chem. Lett.,　36,　504-505　(2007). Excited-State Structure and Dynamics of 1,3,5-Tris(Phenylethynyl)Benzene as Studied by Raman and Time-resolved Fluorescence Spectroscopy. Tomonori Nomoto, Haruko Hosoi, Tatsuya Fujino, Tahei Tahara and Hiro-o Hamaguchi,　J. Phys. Chem. A,　111, 2907-2912　(2007). Proton-Conducting Properties of a Bronsted Acid-Base Ionic Liquid and Ionic Melts Consisting of Bis(Trifluoromethanesulfonyl)Imide and Benzimidazole for Fuel Cell Electrolytes. Hirofumi Nakamoto, Akihiro Noda, Kikuko Hayamizu, Satoshi Hayashi, Hiro-o Hamaguchi and Masayoshi Watanabe, J. Phys. Chem.,　111,　1541-1548　(2007).